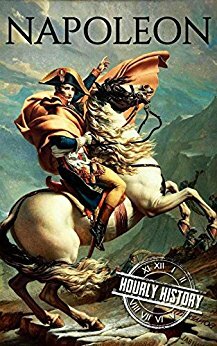 This is a short biography by Hourly History on the famous French emperor of the late 18th and 19th Century - Napoleon Bonaparte. Most of us have heard of him for being the person who made France a superpower and nearly achieved his dream of conquering Europe. It starts with Napoleon’s early life; the fact that he wasn’t even French but in fact, Corsican (island to the south of Sardinia, Italy) and is from a family where his father’s aim was to achieve Corsican independence from France. It then goes on to his interactions with the French elite when he attended school in the mainland and how his political opinions developed; eventually going on to become the face of the French revolution and emerging as the President of the republic (subsequently crowned the Emperor). The book also talks about his military pursuits, his Napoleonic code and also on his ambitious plans to attack Britain. It then touches upon his eventual downfall and retirement to Elba and St Helena where he breathed his last. The book, like any other Hourly History book delivered on the promise of giving the biography in an hour. I liked it that the book touched about his less known Italian heritage and his link to Corsica considering, Napoleon is the very person people think of when they think of France but he himself was often ridiculed for his accent of French. The book also covered all significant events in his life, be it his rise to power, his European conquests, his conquest of Egypt and its eventual failure owing to the sabotage by the British Admiral Horatio Nelson. Napoleon has always been a controversial figure on whom I am yet to take a side; for he is definitely warmongering but at the same time; his views on society and the reforms he brought in were way beyond his time. The disappointment was that this book failed to convince me to take either side or provide sufficient information for me to take a side; for I know about his wars and military expertise, but I would have liked it if the book had written a little more about the reforms that Napoleon brought into the supposed conquered / liberated territories (he preferred to use the latter). On the whole, I would award the book a six on ten.